Fishers and fishing workers experience the thrill of the catch, along with long waits and fruitless searches. They use nets, fishing rods, traps, and other equipment to catch and gather aquatic animals. The fishing boat captain runs the fishing operation, and decides where to fish and when to return to port. Fishing deckhands perform the everyday tasks of baiting… setting lines or traps… hauling in and sorting the catch… and maintaining the boat and fishing gear. On larger operations, crews work together hoisting heavy nets or using machinery to move large catches. They may be at sea for weeks or even months. Some fishers work on small boats with a crew of just one or two, using nets or dredges, or setting out pots and traps for lobsters and crabs. Some workers rake for kelp and other marine vegetation. Commercial fishing can be dangerous, and medical care is often not immediately available. 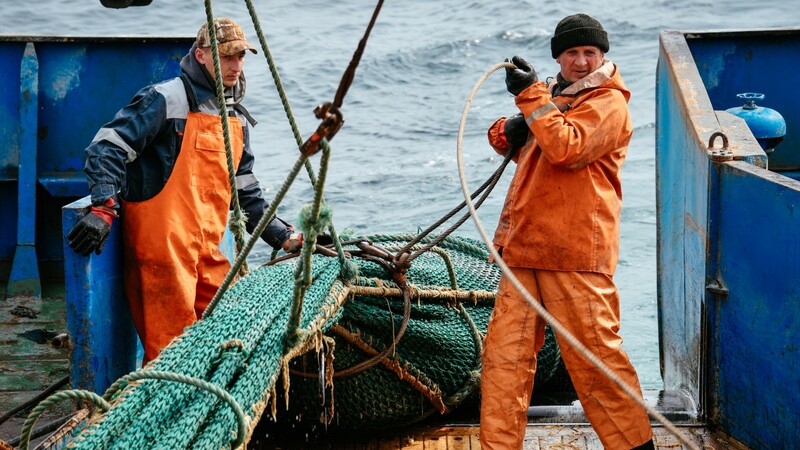 Many fishers are self-employed and are also seasonal workers, working long hours at strenuous tasks. There is no education requirement for fishing; most learn on the job. Captains must be licensed. Fishers need a permit to fish in almost any water. Permits specify the fishing season… the type and amount of fish that may be caught… and—sometimes—the type of permissible fishing gear. See more details at O*NET OnLine about fishers and related fishing workers. Fishers & Related Fishing Workers by U.S. Department of Labor, Employment and Training Administration is licensed under a Creative Commons Attribution 4.0 International License.